Heat the oven to 425°F. In a small bowl or measuring cup, mix the salt, sugar, paprika, mustard and garlic powder. Scrub the potatoes thoroughly with a vegetable brush and water to remove any dirt, but do not peel. Cut each potato in half lengthwise. Turn potatoes cut sides down, and cut each half lengthwise into 4 wedges. In a 13x9-inch pan, arrange the potato wedges with skin sides down. Spray the potato wedges with the cooking spray until lightly coated. Sprinkle with the salt mixture. Bake uncovered 25 to 30 minutes or until potatoes are tender when pierced with a fork. The baking time will vary depending on the size and type of the potato used. 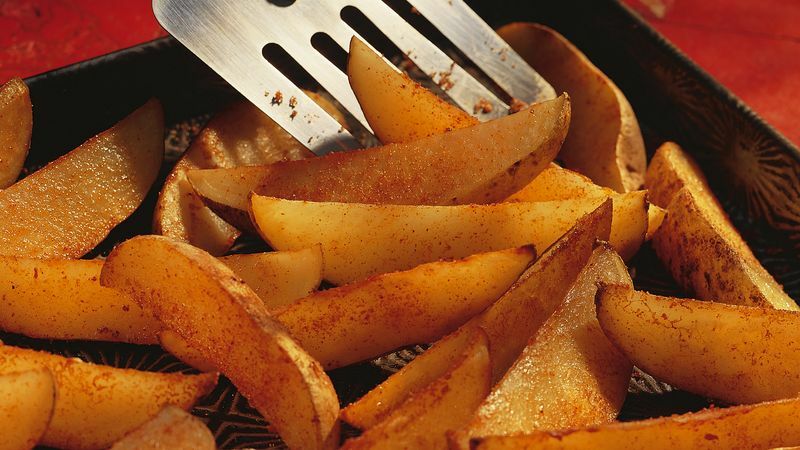 Cut potatoes into wedges just before using, or the cut sides will turn brown. Use russet or Idaho potatoes because they are best for baking. Cut each potato in half lengthwise. Turn potatoes cut sides down, and cut each half lengthwise into 4 wedges.